Just writing the title above started my mouth watering. 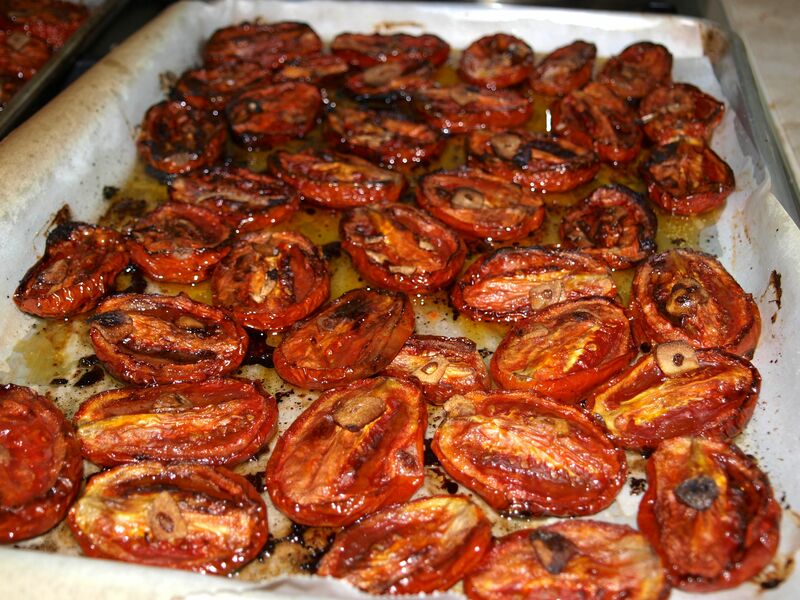 To me, there is nothing better than a slow roasted tomato. They are like candy on a tray. 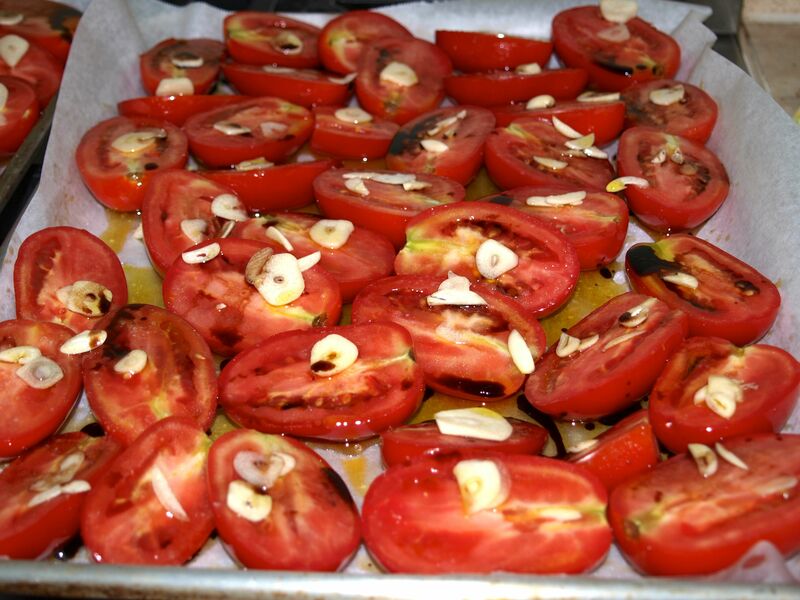 Now that tomatoes are in abundance, the time is here to slow roast them and freeze them for later use in sauces, bruschettas, frittatas, on top of steaks or on in grilled paninis. 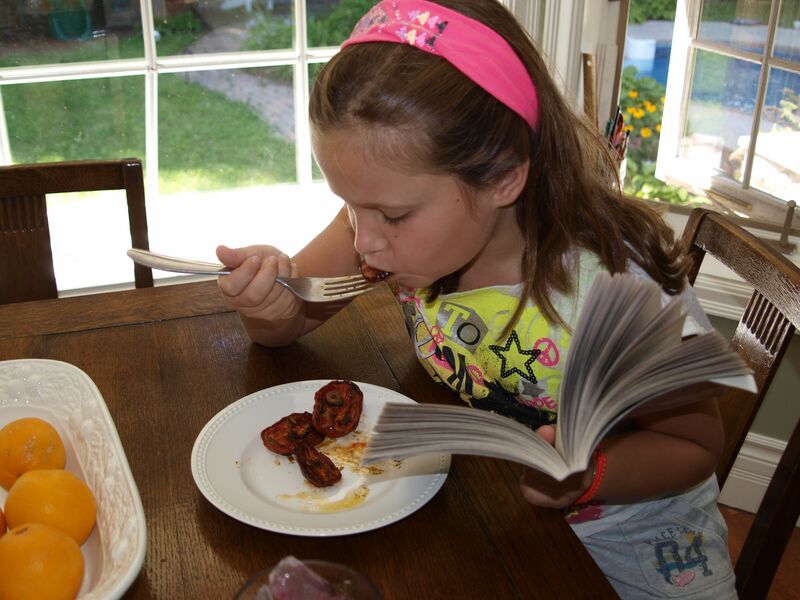 Nothing can match the flavour of a perfectly roasted plum tomato. Book aside a day on the weekend to make these. They don’t require lots of fussing, just time. Make sure racks are positioned in top third and bottom third of oven and preheat to 350F. Prepare two 12×17 rimmed baking sheets, lining with parchment paper and putting 3 tbsps olive oil in the centre of each pan. Wash and dry tomatoes and cut in half through stem. Roll each half in olive oil on tray and continue until each tray is full. Sprinkle each tomato with kosher salt, followed by a sprinkling of sugar. 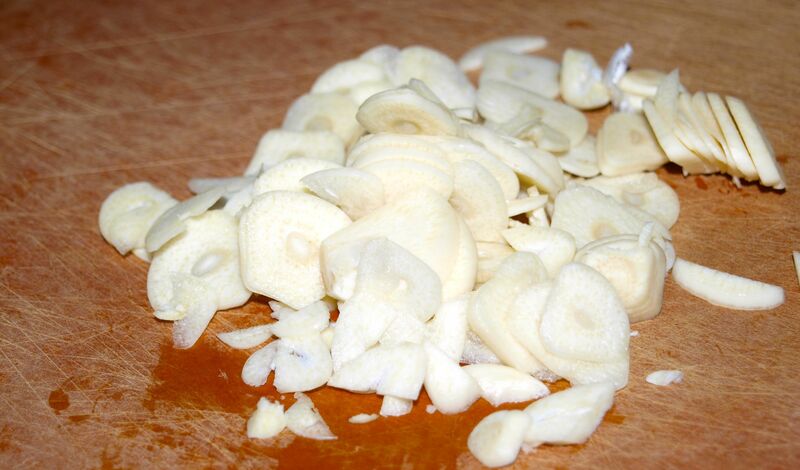 Place a piece or two of sliced garlic on each tomato. Drizzle balsamic vinegar over tops of tomatoes (roughly a tablespoon per tray). Finally pour half a cup of olive oil over and around all the tomatoes on one tray and repeat with other half cup on second tray. Place trays in oven on two racks and let roast for 2 to 2 1/2 hours, switching trays half way through. Don’t worry about overcooking them, worry about undercooking them! Tomatoes should be fully collapsed and slightly brown when done. 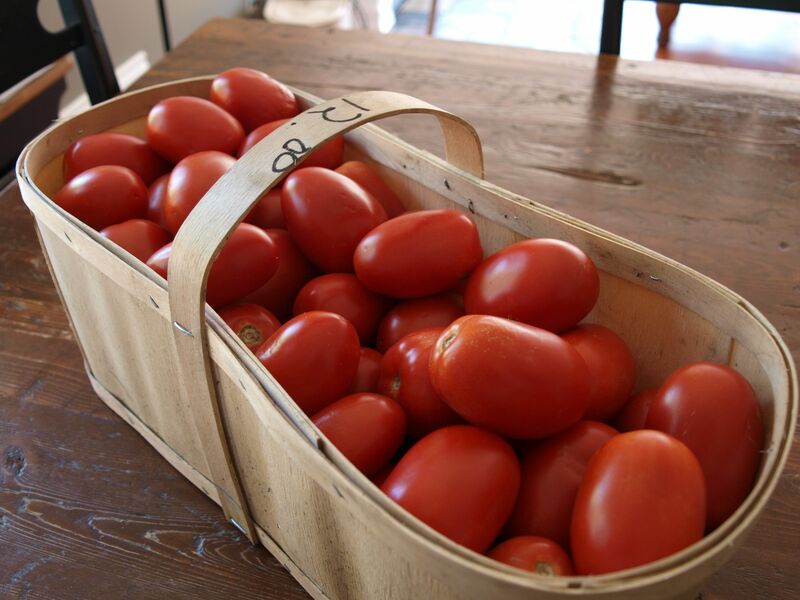 When tomatoes have cooled, store enough in an air tight container to use that week, and put in your refrigerator. 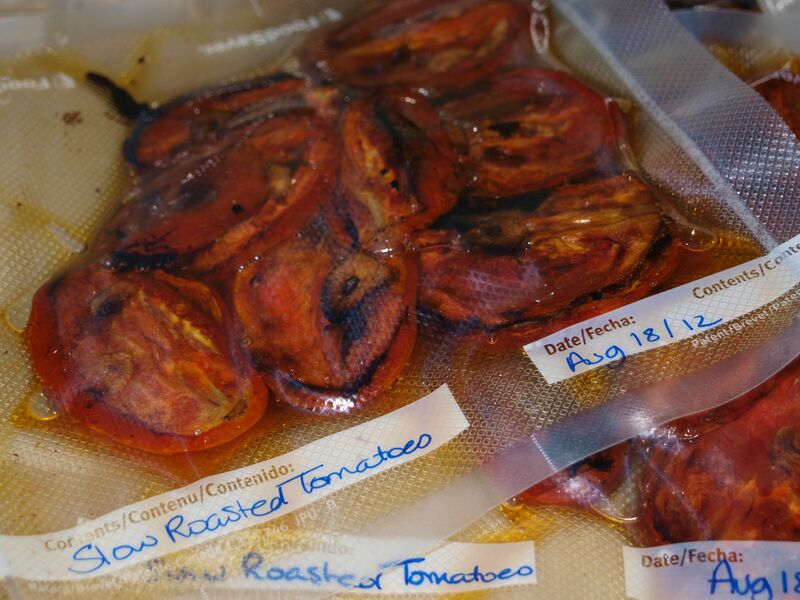 Flat pack the rest in a vacuum packed bag and freeze for use throughout the fall and winter. Good for up to six months in the freezer as long as you make sure frost doesn’t get to them. If you’re anything like my family, you’ll probably want to eat at least half a tray straight out of the oven! Enjoy. We’ll be making these tonight as our tomato plants are out of control!! I have a suggestion for your site (since I print off almost all your recipes): you should implement a printer friendly button/area/something-or-other for your recipes. This one ended up being 6 pages long with all the pics. I’ve added a Print Friendly option at the bottom of each post! Thanks for motivating me to finally get it on here 🙂 Six pages!! Yikes. OMG Candace, I made the recipe this morning and have eaten half a pan already. Best thing ever! I’m going to have to make another batch if I want to do any freezing.